Siomai is originally a traditional Chinese dumpling often served as Dim Sum but somehow it has been assimilated by Filipinos as well. Commonly you can find varieties of it, like beef, shrimp, sharks fin, tuna and many more but the most favored of them all is made with pork. Mix the ground pork together with all other ingredients thoroughly in a mixing bowl. Steam for 20 mins. then serve and enjoy while it’s still streaming hot. 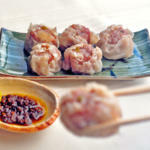 Here is another recipe showing how to make pork siomai.